Hey there! I've missed you! Seriously! - And finally, this isn't so much of a "highlight" but it is a big deal to me: I recently put in my resignation notice at my local quilt shop. I worked at Just Sew in Highland, UT. for 8 years and I am bummed to say good-bye. I am, however, looking forward to finding new focus and new opportunities. Which brings me back to blogging! 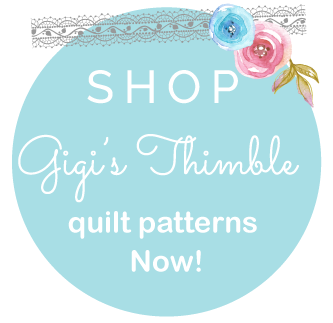 Today I want to finally and officially introduce you to my 6 new patterns, which I call my "Vintage Collection" as they are all based off of vintage quilts. 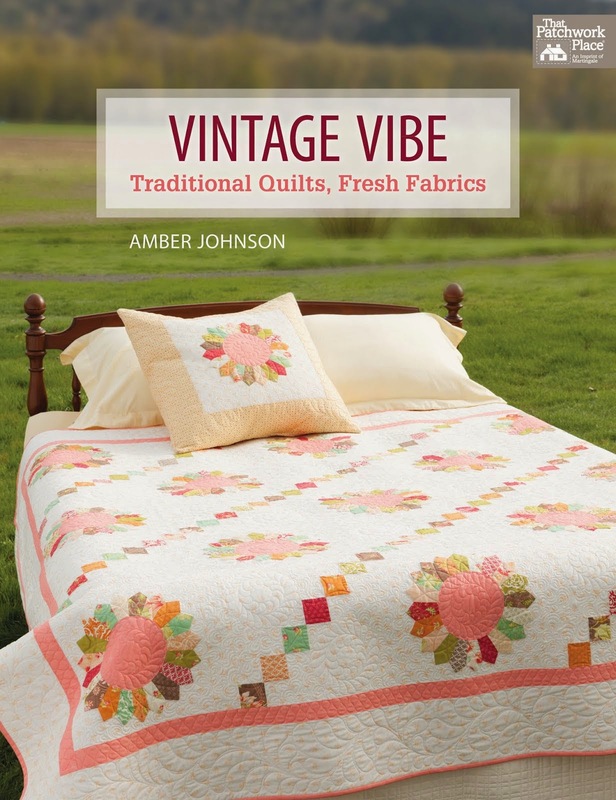 I love the good ol' classic quilt blocks and vintage-inspired quilts and I hope you do too! Ruby is not for the faint of heart. My friend, Aniva (on Instagram as @aniva_rose) made about half of the blocks on this as I was going crazy with Market prep when I designed it! She's amazing and I'm so thankful for sweet friends like Aniva!!! Ruby was made up with scrappy fabrics from my stash and comes with instructions for 4 size options (throw, twin, queen and king). Jack combines two of my loves: 9-Patches (a classic for sure) and neutrals. Black and white never goes out of style but I think it would be wonderful in any colorway. There's lots of room to get creative with color on this one! And wait, it also has straight-line quilting on it (which is another favorite of mine) so that's three! This quilt has found a home in my family room on my husbands recliner. Jack comes in 3 size options (throw, twin and queen) and was made with scrappy low-volume and black fabrics from my stash. The third pattern is a little different from the rest. It's my Scrappy Strip Block Paper Piecing Patterns. 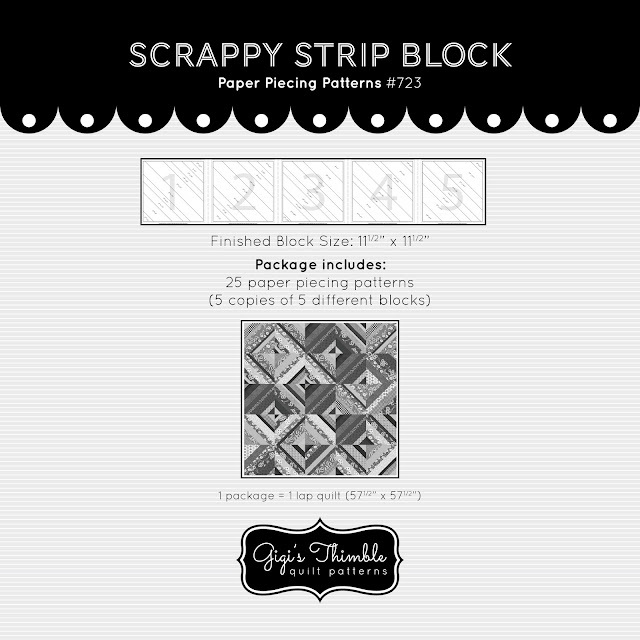 Each package of Scrappy Strip Block Paper Piecing Patterns comes with 5 copies of 5 different blocks (which make a nice lap size quilt when sewn together). The size to cut your strips is printed on each strip so you can cut as you go and they were designed so you won't have any itty-bitty triangles in the corners of your blocks. They can be used on their own to make a scrappy string quilt OR with the companion pattern, Ava (which is the 4th pattern in my Vintage Collection). Ava was quilted by Denae Hansen who lives in American Fork, UT. I've used Denae a couple of other times since then and she does absolutely beautiful work! She does both hand-guided and computerized quilting. This was hand-guided. Ava comes in 3 size options (crib, twin and queen) and was made with mostly Katie Jump Rope fabrics by Denyse Schmidt plus a few from my stash. The awesome check fabric on the back is by Maureen Cracknell for Art Gallery. It was just sitting around it my stash (being awesome) and I knew it was the back for Ava. Lulu is Jelly Roll friendly and one of the easiest patterns you'll ever make. She comes in 2 size options (lap and twin). My friend, Christine Cook (on Instagram as @stitchingrevival) put this together for me. She did an awesome job and completely saved the day in all my Market prep mayhem! And last, but not least, is Pearl. I love Pearl. One of the true classic blocks. but really isn't as hard as it looks. The quilting was again, done by Denae Hansen in this simple, yet beautiful cross-hatching. I have never had this kind of cross-hatching done before but it is a new favorite for sure! Also, I collected some beautiful Liberty of London fabrics for this project and they were a dream to work with! Oh, and don't worry if you've never done curved or paper piecing before, Pearl comes with 4 size options (mini, crib, twin and queen) and the mini is the perfect place to start! It may even add a little sunshine to your life! Well, that's it for the Vintage Collection! Thanks for sticking around through the worlds longest blog post! I plan to be around more often so please feel free to leave a comment. I'd love to hear what you think about my new patterns. Also, I'm taking ideas on future blog post ideas too! P.S. 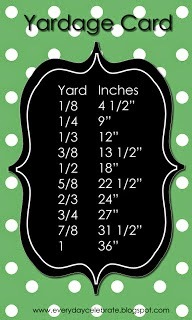 All patterns are available in my Etsy shop! Click HERE. all items through Sunday (9-18-16). So good to see you back! I'm looking forward to putting my DS collection to good use in Ava this winter. But Jack in navy would be awesome as well! Love your work! I'm completely smitten with the simplicityand neutrality of Jack! Thank you for the discount and congrats on the new chapter in your life! Wow, Amber, that really is news that you are leaving Just Sew! They have helped your dreams come true, haven't they? As soon as I read on Instagram that you had a new post on your blog, I raced to read it because I always love hearing what you have to say. Your Vintage Collection is awesome! Well darn, was hoping I'd run into you at Just Sew again! But fun that you're on to something new. I know it will be awesome! I love all your projects and it was wonderful seeing them in person at Quilt Market. So many beautiful quilts! Hard to pick a pattern! Love your patterns! They're lovely! Great new patterns. I especially like that Ruby one. Good to have you back blogging. Yay!! 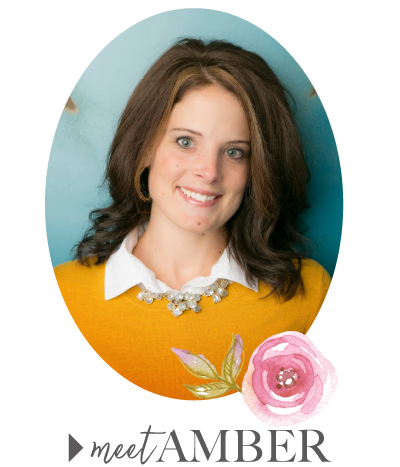 Glad to see you blogging and love love love your quilts!! I love this post, Amber. Your quilts are beautiful!